So much of our novels are made up of description. We describe what our characters look like. We describe the mountain ranges that surround the protagonist’s home. We describe the actions the antagonist takes to reach his or her goal. But how should we write description? We have all heard “Show. Don’t tell,” but how do we do that? Before you can start writing your character’s world, you have to be an observer of your own world. When you’re out shopping, pay attention to how people walk or what they buy. When you travel, see what differences you can find in the way people talk or how they react to others. Take in the sights, sounds, smells, and feelings of the places you go to. Is your office illuminated by white light and kept frigidly cold? Is the subway crowded and dirty or empty and well-kept? 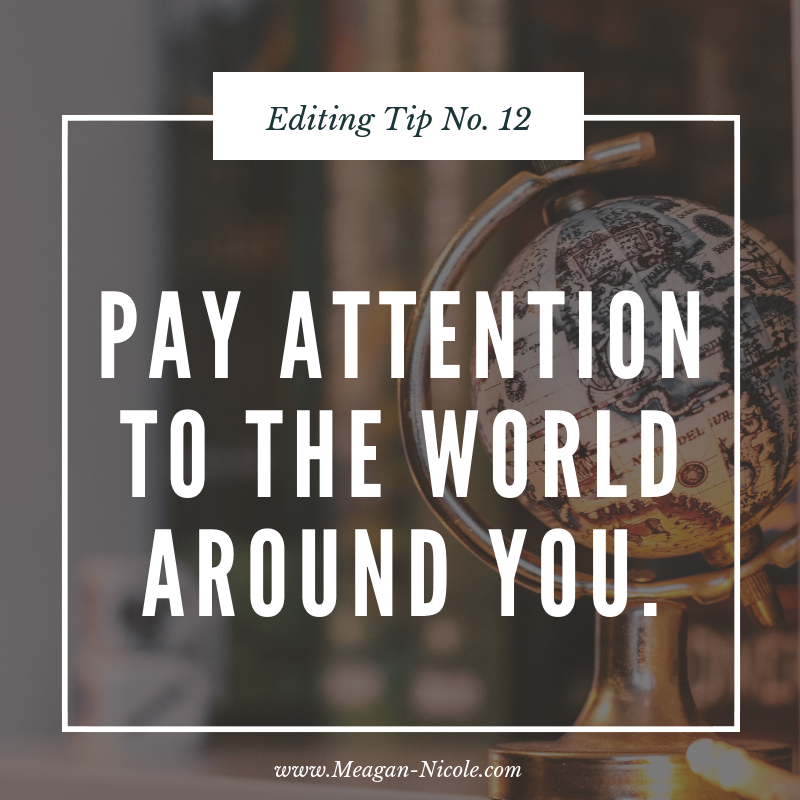 Once you start paying attention to the world around you and thinking about what you see, you will be able to draw on those personal experiences to better write your stories. By using words that relate to your readers’ sight, smell, feeling, and hearing, you’ve given them something to anchor themselves too. It won’t matter if your readers have never been to modern day New York City or Ancient Greece or outer space because you will give them description they understand. No senses: Amelia walked into the café and found Justin sitting in a back corner booth. Senses: Amelia walked into the café and was greeted by the smell of freshly ground coffee. She breathed deep, her tastebuds eager to get a hot cup in her hands. She found Justin sitting in a back corner booth. His green eyes were vibrant in the early morning light, drawing Amelia over to join him. If you can apply this one technique, you will see your description change radically! The skill of writing beautiful description that pulls your readers in while developing character and plot takes time and practice. It won’t happen overnight, and it takes effort. My favorite way to practice is to use an image I’ve never seen before to write a short piece, focusing on how to describe what I see in the picture. Take time out of your day to observe the world around you and think about how you would describe what you see. Practice writing description using your senses. Want to share a before and after of your own line of description? You can do so in the comments below!